Previous Status : Primary mass produced armour, in general use by the ACTF. Present Status : Being decommissioned from active service. Surplus Units being sold to ACTF allies as they are replaced with Blue Type V2 units. Limited production continues for non-military applications, such as construction and law enforcement SWAT. 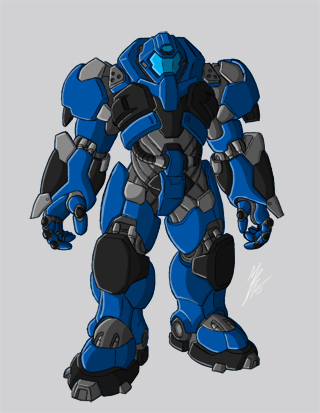 Description : The Blue Type Cybernetic Battle Armour was the second mass production battle armour to have been developed by the U.S. to counter the advantage that even a low level Zoanoid has against the typical human soldier. Possessing superior dexterity, mobility, speed, and strength enhancements than the previous Red Type Armour. The Blue Type units more than evened the odds in the field of battle against all but the more advanced Hyper Zoanoids and Zoalords. This addition to the U.S. arsenal, combined with the growing number Guyvers, brought for the first time doubt as to the outcome of the war and Chronos previously assured victory. Now, even as more advance armours takes it place, this armour still advances the goals of the ACTF in service of its allies. -Physical strength has been rated to be equivalent to that of fifteen men, which makes it equal in strength to the Gregole Class Zoanoid. 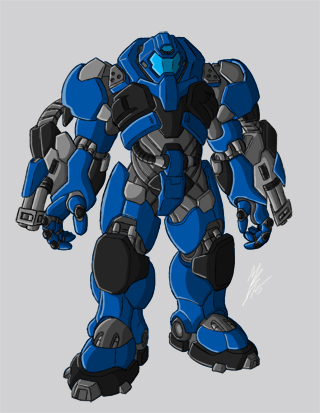 -Speed: Unlike the previous Red Type Armour, the Blue Type provides the wearer with the full range of movement and mobility as they would normally have un-armoured as well as enhancements due to the built in jets that allows unit hovercraft level mobility up to 100 MPH, with the ability to jump over obstacles as high as thirty feet. -Durability levels are quite high due to a special composite armour material and is slightly superior to the Gregole class Zoanoid in its dexterity but a Vamore class weapon Zoanoid can still induce enough damage to cause severe localized damage to armour and secondary burns to wearer. Armour is optional for the non-military built version to limit cost of unit. -Sensory perception: Armour is equipped with the latest H.U.D. tactical display with auditory and visual enhancers that respond automatically to changing combat situations. -Weapons: The Blue Type Battle Armour is equipped with a variety of weapons including an arm mounted electric gun that fires 20mm H.E. caseless armour piercing rounds, short range guided mini missile shoulder mounted pods (optional, depending on mission specifics), jack hammer armour piercing wrist mounted spike for close range combat, and laser targeting system that is of sufficient power to blind the average Zoanoid. The non-military built version of this model replaces the weapon modules with sockets that can be used to attach construction equipment such as a welder and/or bolt gun. -Other abilities and tools can be added depending on the combat situation the unit will be put in. -Special Note: Though this armour type is being phased out of active use by US military forces, this armour type is still being mass produced for use by rebel forces in other parts of the world, slowly replacing the previous Red type. The armour is also being sold to other nations around the world in exchange for food and natural resources that the war with Chronos has caused the US to be in short supply of, along with other US developed military weapons, such as the Wolf series battle armour. -Additional Note: Units equipped with classified US technology have all been downgraded to prevent any accidental release of classified technology as surplus units are sold to our allies.